Home » News & Events » Community Garden Grows 853 Kilograms of Produce for Port Cares Food Bank! 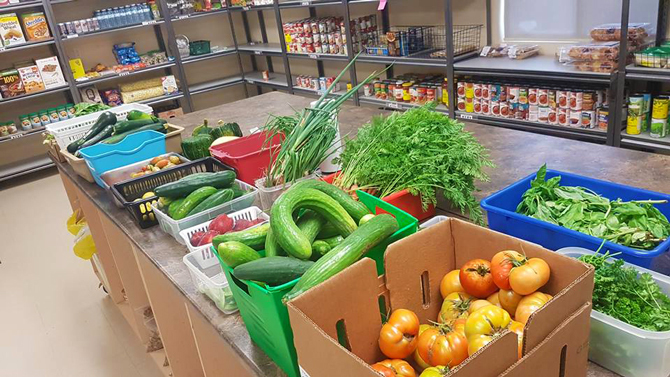 Port Colborne, ON – The Lockview Park Community garden wrapped up its first growing season bringing in a bounty of 853 kilograms of fresh, healthy produce to the Port Cares Food Bank. 11 raised garden beds were built and cared for this season; eight large beds and three smaller beds for expanding plants. The plots were maintained by a team of compassionate volunteers, the City, local companies and youngsters from the Blooming Gardeners program that came out twice a week to learn how to grow their own food. The Reach Out Food Centre supports 600 people every month, a third of which are children under the age of 18. The food bank goes through approximately 6,750 kg of food per month, including 450 kg of produce. The produce is donated to the food bank by local grocers, farmers, individual donors and community garden plots like the one at Lockview Park. The garden is sponsored by the City of Port Colborne, Tender Cuts, Raw Materials Company, Marine Recycling Corporation and Iron Earth Canada. Before the first seedlings were planted, Iron Earth Canada donated enough organic soil re-mineralizer to fill all 11 plots. The all-natural soil conditioner rejuvenates mineral deficient soil, giving vegetables a healthy boost of minerals and essential nutrients. Iron Earth is a completely natural soil re-mineralizer and contains no synthetic chemicals, more information is available at ironearthcanada.com. Organizers plan to expand the garden with additional plots next season. Anyone from the community that wants to maintain a plot or volunteer to help can contact Sarah Lacharity by email at slacharity@rawmaterials.com. The Port Cares Reach out Centre serves the communities of Port Colborne and Wainfleet and is open Monday, Wednesday and Thursday from 12:30 - 3:30 p.m. at 61 Nickel Street in Port Colborne. The office is also open Monday to Thursday from 9:00 a.m. until 4:00 p.m. to receive donations.